When my fiance saw my little memo to myself, he told me he couldn’t tell whether it was the stick figure asking the question or the wall. I’m a great artist. The conversation then progressed to me explaining that what I really needed was a role so challenging that I questioned and bemoaned it until I achieved something. I needed an obstacle course I could feel proud of navigating. Little did I imagine at the time that I would step out on my own and start my own consulting business. The night I sent in my resignation letter, I suddenly thought to myself that this was a good time to start my own business. I had never entertained such a thing, as I credited myself with not a single entrepreneurial bone, much less the spirit. I was reading Secrets of Six-Figure Women at the time, however, and something about all those success stories must have sunk into my brain and mixed in with the knowledge that my climbing partner, Erika, had been working on some businesses of her own. I had also been researching independent consulting as a tax sheltering option, where I might further pursue Financial Independence by having the corporation contribute to a retirement plan on my behalf, above and beyond the $18,500 401k federal contribution limit. To do so, I needed a Financial Advisor, a tax accountant, and a lawyer. I wrote those on my bathroom mirror, and went ahead and asked for recommendations for a financial planner on Facebook. I kicked it off, and in my head, it all came together on Sunday night as I drifted off to sleep. The next morning, I rolled into the office-wide eyed and bushy tailed, ready to make a statement. I was hesitant about declaring my intent in the first hour or so of the day, and when people asked where I was going, I’d dodge the question and say “I haven’t decided” or “I’m working on a few things”. By noon, however, I was fully in the researching phase of starting my own business. I was alternating between reading Secrets of Six-Figure Women and was surprised when I checked facebook that I had several recommendations and resources in my comments. One of them was the book Your First CFO, which I found as an eBook at my local library. Now I’m not entirely sure where I’m going to find my first client, whether any of the leads I get are going to sign with me, and I’m feeling myself balanced rather precariously halfway up a rock wall I hadn’t fully mapped out for myself. All I know is that I put myself here, and I have to find my own way down. Whether I reach the top before that happens and accomplish my goal or re-evaluate my ability to continue remains to be seen. But my fiance is doing a great job of keeping me grounded and pointed in the right direction. 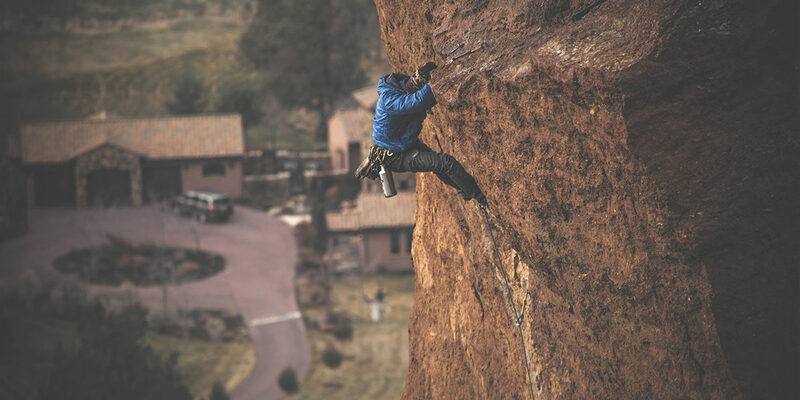 He doesn’t climb, but he’s playing the role of the man on the ground, pointing out the footholds and handholds that I may not see while I’m too close to the problem. And for that, I’m grateful. You’re reading this now because I inched myself up a little higher on the rock wall and hired my friend at Rule27 Design to build me this website. It’s great progress in my book, because I’ve always wanted a website I could point people to for both my professional accomplishments and my personal blogging vanity. It’s a stable foothold I can continue from, and I’m looking forward to figuring out my next move.